In this file you can see different locations, such as the Cádiz tour and the Gala dinner. Esta entrada fue publicada el 12 junio, 2018 por Jesús Medina. Esta entrada fue publicada el 10 junio, 2018 por Jesús Medina. Esta entrada fue publicada el 2 marzo, 2018 por Jesús Medina. The EUSFLAT Society will offer grants of 350 euro each to support students for attending IPMU 2018. 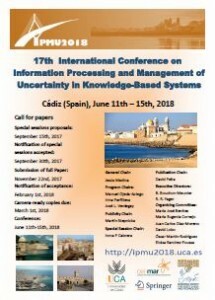 The candidates must send a message to ipmu2018@uca.es with the required data for the evaluation (see main criteria). The deadline for sending requests is March 11th. The candidate must be author or co-author and presenter of an accepted paper, and (s)he must be an EUSFLAT student member (M.Sc. or Ph.D.) at the time of application. The Student Grant responsible on the EUSFLAT board will make an evaluation of the applicants. – EUSFLAT membership of supervisor(s), etc. Previous grant holders of these grants can be seen in the EUSFLAT web page. The deadline of the early registration fee will be delayed for the applicants, until the grant holders will be announced. Best regards, Chairs IPMU 2018. Esta entrada fue publicada el 28 febrero, 2018 por Jesús Medina. Esta entrada fue publicada el 11 diciembre, 2017 por Jesús Medina. During IPMU 2018 we will pay homage to Lotfi A. Zadeh. Different activities are being planned in memoriam of the father of Fuzzy Logic. Esta entrada fue publicada el 10 septiembre, 2017 por Jesús Medina. Esta entrada fue publicada el 1 agosto, 2017 por Jesús Medina. You can see them in this link. Esta entrada fue publicada el 29 julio, 2017 por Jesús Medina. 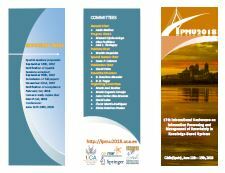 The EUSFLAT Society will offer grants to support students for attending IPMU 2018. Esta entrada fue publicada el 1 julio, 2017 por Jesús Medina.